В 1928 году появился моноплан Chapman-Burnelli CB-16, фюзеляж которого имел аэродинамический профиль и который можно считать первым широкофюзеляжным самолетом в мире. В кабине длиной 5,49 м, шириной 3,45 м и высотой 1,68 м помещалось до ДальшеMore>>> 20 пассажиров. Высокорасположенное крыло и фюзеляж изготовлены полностью из металла, а каркас хвостового оперения сварен из стальных труб и обтянут полотном. Шасси - с хвостовой опорой, основные опоры убирались в полете вручную. Силовая установка включала два V-образных мотора Curtiss GV-1550 Conqueror мощностью по 625 л. е.; оба мотора установлены в носовой части фюзеляжа бок о бок. SEVERAL years ago (July 28, 1921) we described and illustrated an American machine, the Remington-Burnelli biplane, in which the fuselage was given an aerofoil section and in this way, it was claimed, contributed towards the total lift of the machine This first biplane proved to be a successful flyer, with a comparatively good performance - and is still, we believe, in service - and just recently this principle has been further developed. 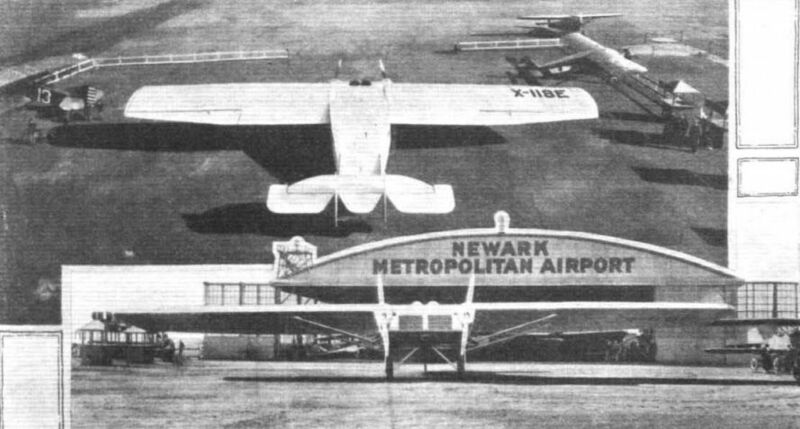 The new machine is a monoplane, designed by Mr. Vincent J. Burnelli, and constructed under his supervision at the Aeromarine factory at Keyport, N.J ., for Mr. P. W. Chapman for operation by Sky Lines, Inc. Besides embodying this aerofoil-section fuselage idea, this plane is also noteworthy in being of all-metal construction on somewhat original lines. We understand that a series of demonstration flights - and data as to performance and the worth of the system - will be carried out throughout the States, while it is also planned to send a machine over to England for demonstration. In this latter connection it may be of interest to note that the Burnelli aircraft are represented in this country by A. P. Thurston and Co., of 329, High Holborn, W.C.I. In the following notes we are able to give our readers some brief particulars, together with general arrangement drawings and illustrations, of the Burnelli monoplane. It should be incidentally full-scale test flights providing comparative mentioned that the machine was flight-tested on January 8 last by Lieut. Leigh Wade - one of the U.S. Round-the-World pilots - when four flights covering about 1 hour were made with successful results. During the first flight, with only two up, the machine took off in 147 yards and was in the air after 6 secs. With the engines (two 625-700 h.p. Curtiss "Conquerors") two-thirds throttled, the 'plane climbed to 3,000 ft. in 7 mins. In the second flight, with five passengers, the machine was in the air in 7 secs, after a run of less than 100 yards, while in the third flight 12 passengers were carried and the take-off was 9 secs. ; the fourth flight was similar to the previous one. The machine landed at an average of less than 50 m.p.h. and never ran more than 100 yards before coming to rest, although wheel brakes had not yet been fitted. The wings, which are of Mr. Burnelli's own design, are of somewhat unusual construction, this being of the transverse stringer type, requiring no ribs, the stringers running from end to end and the whole being covered with corrugated sheet duralumin. Drag trusses are located at intervals along the wing. As will be seen the wings are of thick section, slightly tapering in plan-form at the tips. 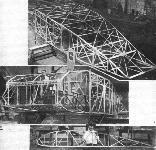 They are braced, on the underside, to the fuselage by fairly wide streamlined struts, one pair each side, and are attached directly to the sides of the fuselage, flush with the top. The fuselage, which is 36 ft. long and 12 ft. wide, and accommodates 12-20 passengers, has a lift of 4 lbs. per sq. ft., and owing to its unusual design it reduces the landing speed at least 12 per cent. - this resulting from the air cushion effect it produces as it nears the ground. The wings are calculated to have at least 14? lbs. per sq. ft. lift and have been tested to support a load of 28,000 lbs. The furnishing and equipment of the cabin, which is 18 ft. long by 11 ft. 4 in. wide by 5 ft. 6 in. high, are quite luxurious. The "Adapto" upholstered seats are set on swivels and can be made to assume any position from upright to recumbent, and are wide, roomy and comfortable. 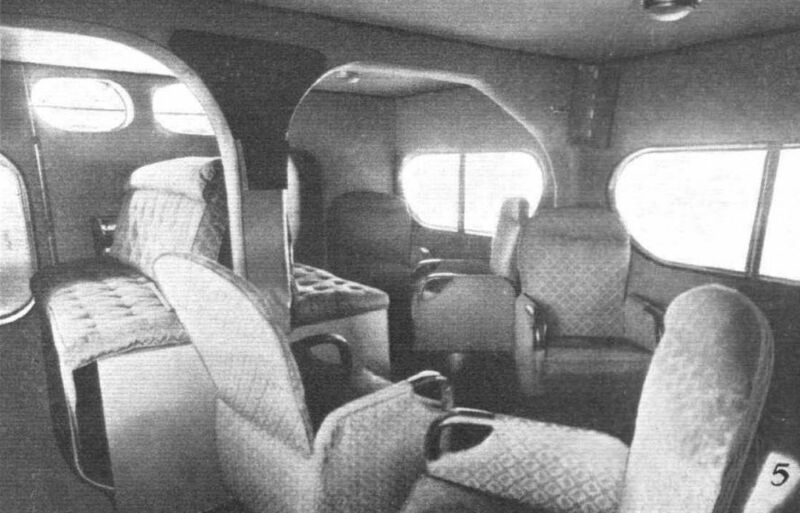 The whole of the interior of the cabin is upholstered in grey, and in the centre is a large lounge, built over the main fuel tank. At the rear of the cabin is a kitchenette, on the right, and a toilet room, on the left, both complete in every detail. Monel metal is used extensively in these compartments, which with the dural and aluminium gives a very smart appearance. In a panel at the rear of the cabin, where they are readily accessible, are the wireless controls, the wireless set having a range of 300 miles. The cabin is sound-proofed with Balsam wool, while silencers specially designed for the engines are fitted, so that the machine is, it is claimed, as quiet as a motor car. Electric lights are fitted throughout, the main lights being set in the ceiling, while several base plugs are provided for reading and writing lights. Two pilots' cockpits are located right forward in the top of the fuselage, while doors and windows are provided in the bulkhead between the pilots' compartment and the cabin. Another noteworthy feature of the Burnelli monoplane is the retractable undercarriage. By means of a. lever, operated by the pilot or a mechanic, the two wheels can be retracted into the fuselage, this lever also indicating the position of the wheels, although to avoid the possibility of an error there is a red electric light which is visible to the pilot all the time the wheels are retracted. The wheels are carried by enclosed V-members, hinged to the lower outer edges of the fuselage, which fold inwards, the wheels fitting snugly within recesses formed in the bottom of the fuselage. The wheels may be retracted completely in 17 seconds, and extended again in 8 seconds. The two Curtiss "Conqueror" engines are mounted, at the front "corners" of the fuselage, on a triangular frame, and can easily be swung out from the vertical line to allow of replacements or repairs being made without removing the engines from the machine. Also the engines are easily "got at" from within the fuselage, so that adjustments can be made during flight. Another point to note in connection with the engines is that they are mounted so that the line of thrust is at a slight angle to the fore and aft axis of the machine, i.e., the left engine has a tendency to pull to the left, and the right to the right. The machine can thus be flown with only one engine without requiring correction by use of the rudder. During the tests the machine actually climbed to 1,000 ft. on one engine, with the wheels retracted. The rudders and elevators, which are balanced, are set high above the slipstream and are free from interference from the latter, while the horizontal stabiliser is adjustable. Two fuel tanks of 280 galls, each are mounted in the wings, and a third tank of 440 galls is located in the cabin. Thus the total fuel capacity is 1,000 galls., which would give it a range at cruising speed of 2,400 miles with 12 passengers (and 20 hours' fuel), or 800 miles with 20 passengers (and 7 hours' fuel). With the calculated overload of fuel it would have a range of 4,000 miles. Wing area (approx.) 1,018 sq. ft. Weight (without fuel) 8,700 lbs. Useful load (with 7 hours' fuel) 4,000 lbs. Speed range 52 to 145 m.p.h. Cruising speed 115 m p h .
Fig. 4 is a view of the Burnelli monoplane itself, being flight-tested by Lieut. Leigh Wade at Newark (N.J.) airport. The heads of the pilots are clearly seen, thus illustrating the good range of vision obtained. The landing wheels may be retracted into the fuselage, as shown in one of the illustrations in our previous description of this machine. THE BURNELLI MONOPLANE: Three-quarter front view, and (above) the machine in flight with the landing wheels retracted. It is fitted with two 625-700 h.p. Curtiss "Conqueror" engines. THE BURNELLI MONOPLANE: Rear and front views of this new and original American air liner, It is of all-metal construction, and the fuselage has an aerofoil section, which contributes to the lift. Figs. 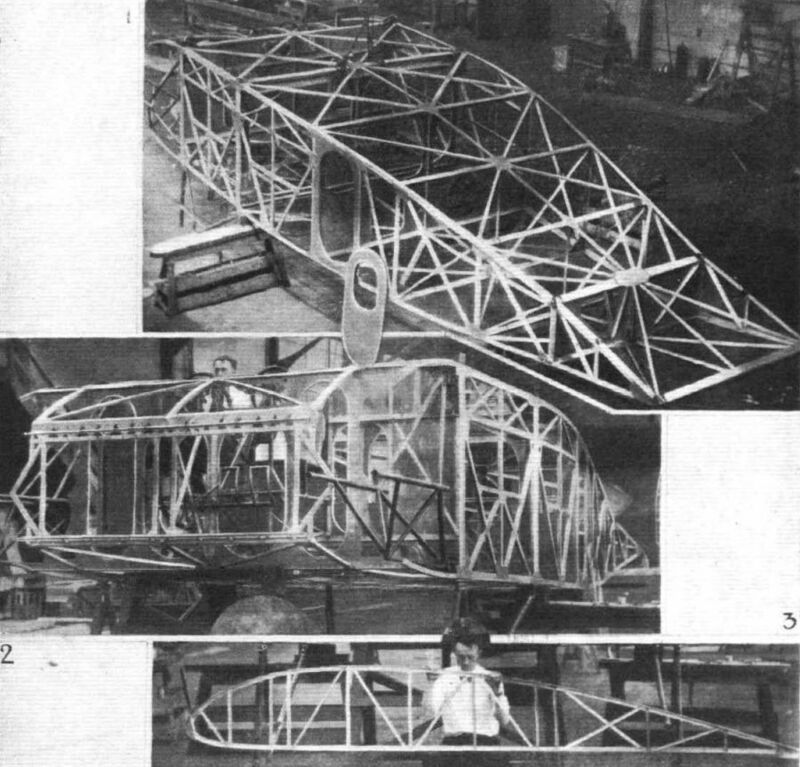 1 and 2 are skeleton views of the fuselage, which is constructed of extruded dural, heat treated, drawn to various sections - angles, tees and channels - built up into a truss framework which is covered with corrugated dural. Fig. 2 clearly shows one of the two tubular steel engine mounts. These are pivoted in the front "corners" of the fuselage and are not only detachable but can swivel outwards, thus facilitating engine replacement and adjustment. In addition, the engines (two 500-h.p. Curtiss "Conquerors") are "getatable" from inside the fuselage. The dual controls are also shown in this view. Fig. 3 is one of five "former-ribs" used on each wing panel, also made of extruded dural, which support the lateral stringers to which the corrugated sheet dural is fastened. There are no other ribs, as in orthodox wing construction, the shape of the wing being maintained by these former-ribs and stringers built up around the main spars. Drag trusses are used at intervals. Fig. 5 is a view looking forward inside the cabin, which can accommodate 20 passengers. At the head of the cabin are the two windows immediately behind the pilots' seats, and on the pillar in the centre are mounted altitude and speed indicators lor use of the passengers. The large lounge in the centre is arranged on top of a 400-gallon petrol tank (there are also petrol tanks in the wings). Figs. 5 and 6 are two more interior views, looking aft, on the port and starboard sides respectively, showing, behind the main cabin, the compartments arranged for toilet, kitchen, and wireless. The woodwork of the cabin is walnut and the rinish is in grey.